This incredible Morocco sahara desert tours 3 days 2 nights, will create for you an unforgettable trip enjoying the best of Sahara desert climate, and discovering the life and the culture of its people. Travel through the magnificent High Atlas Mountains and explore the berber villages, the enchanting Ait Ben Haddou Kasbah will just fascinate you by its sandy castle. Moreover, explore the wonderful wonders as you make your way to the Sahara desert, stay in a traditional accommodation. Furthermore, Make your way to the Sahara on camel rides and relax in the luxury desert camp. Morocco sahara desert tours 3 days 2 nights begin from the heart of morocco ” Marrakech “. Departure in the morning from your hotel or riad in Marrakesh crossing the High Atlas Mountains known Tichka pass. Then, we will leave the main road and take the side road to the Kasbah of telouet, which belonged to the Glaoui family. In particular, its ruins are still exisiting till nowadays. From there, we will continue along the new and stunning beautiful road, lunch will be at Ait Ben Haddou, the most famous Kasbah in Morocco, and is a UNESCO World Heritage site. Which you can visit after lunch. Next, we will pass Ouarzazate to Skoura Oasis, where numerous ancient Moroccan kasbahs ruins stand among the palm trees. Then,we will go through Kela’a M’gouna, the Valley of Roses, with a stop to see cosmetic articles locally-made from the valley’s abundant roses. Finally, overnight will be in the Dades gorge(BB). After breakfast, you will walk to explore the area. Then, we will drive to Toudgha gorges. Lunch will be in the gorges, or in the Erg Chebbi dunes. Then, we will continue via Ziz Valley, and the towns of Erfoud and Rissani. In the afternoon with a Moroccan hospitality of a glass of mint tea. Certainly, you can take two-hour camel ride in the Desert to watch the sunset from the top of the dunes. Then, you will have a spectacular dinner and night in a nomad tent, and sleep under the stars (DBB). 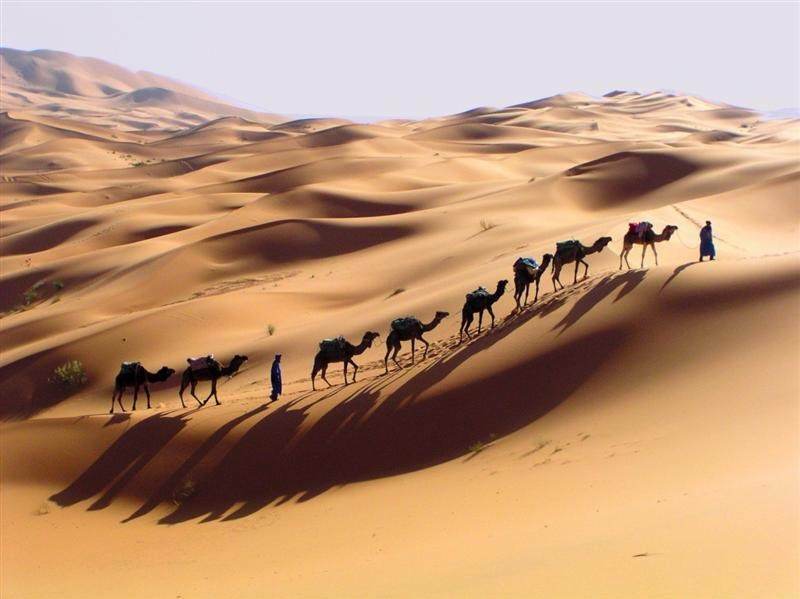 End of Morocco sahara desert tours 3 days 2 nights, in the heart of Sahara desert. Next day, your camel man will wake you up to see the most beautiful sunrise you have never seen in your whole life. Amazingly, the color of the dunes and the play of the shadows give an awesome sight. Next, we will drive to the Dra’a Valley, which takes us along the length of the Saghro mountains. Crossing the villages of Tazzarine (featured in the film ‘Babel’) and N’Qob. Where we will have lunch overlooking the mountains. In the afternoon, we will drive to Tanasikht. Then, we will reach the Dra’a valley, full of large palm trees and ancient kasbahs. Here we go along the track of the ancient caravan route to Agdez. Plus, the oldest kabsah in the valley, Kasbah Tamnougalte. Back on the paved road again, we return Via the High Atlas. Hence, end of Morocco sahara desert tours 3 days 2 nights in Marrakesh in afternoon(BB).